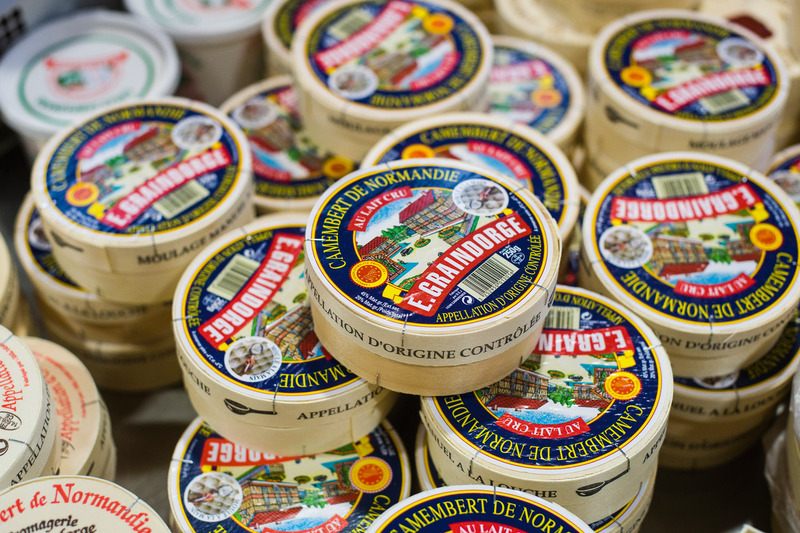 Boxes of Camembert de Normandie from Fromagerie Graindorge, France. Normandy cows graze in an apple orchard in Pays d'Auge, France. Andrew Marshall takes us on a culinary tour to find the best examples of French cheese in Pays d’Auge, Normandy. Normandy’s Pays d’Auge region is a picturesque landscape of small villages, rolling meadows dotted with grazing cattle, russet-coloured apple orchards and half-timbered farmsteads; a land where creamy cheeses rule and a quartet of France’s finest are made: Camembert, Pont l’Évêque, Livarot and Pavé d’Auge. With its oozy golden-yellow centre, creamy-white rind and buttery flavour reminiscent of wild mushrooms, the circular Camembert is Normandy’s signature cheese. Its origins are relatively young in cheese-making terms: Marie Harel, a local farmer’s wife, is said to have invented it during the time of the French Revolution, selling it in the market of Vimoutiers (where excellent farmhouse Camembert is still available today). Folklore has it that one of Marie’s descendants took advantage of meeting Napoleon III, presenting him with a Camembert wheel and thereby assuring the future of this most French of cheeses. While Camembert is a relative newcomer, soft cheese has in fact been made in Normandy since the 11th century. Two lesser-known and much older cheeses are Pont l’Évêque, an uncooked, unpressed cow’s milk cheese that is square in shape, and Livarot, an ancient and noble cheese that dates back more than 700 years, originating with monks. During the 19th century, Livarot became the go-to cheese in Normandy and was dubbed ‘the workman’s meat’. One of the most complicated cheeses to make, it sits in a cellar for up to six weeks and the rind is periodically washed with lightly-salted water. For a closer insight into cheese-making, visit Fromagerie Graindorge, a cheese producer in Livarot that offers free tours and tastings. On display are old cheese-making implements, milk churns, cheese moulds and a replica of the world’s largest Livarot cheese: measuring around one metre in diameter, it was made from 1165 litres of milk and shared between the very satisfied residents of the town on a special fiesta day in 2008.